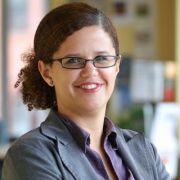 The World Resources Institute (WRI) and the Jamaica Environment Trust (JET) announced today the launch of the newest tool from WRI’s Access initiative, Development Alert!. Built by Blue Raster, the free, mobile-friendly site provides the public with greater access to information about development projects affecting the environment and public health. The site plots approved and proposed large-scale development projects along with overlays of protected areas, fisheries, forest reserves and land cover so users can easily identify projects in or around environmentally sensitive areas. In Jamaica, Development Alert! is helping promote transparency and public involvement in projects including the trans-shipment port in Goat Islands. The project is expected to flatten the Goat Islands to develop a $1.5 billion trans-shipment port. 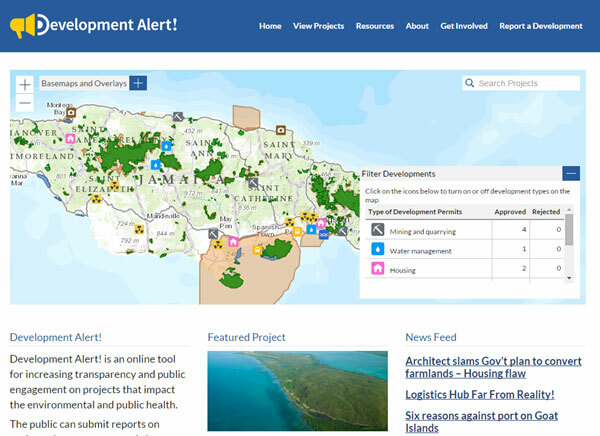 Using the map of Jamaica in Development Alert!, members of the public can see that this project is not only located in a protected area but is also within a forest reserve and Special Fisheries Conservation Area. 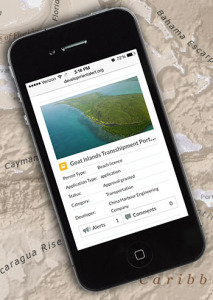 See the Goat Islands Project in Action.